[Defending Lars Hedegaard:] "A Stew of Anti-Muslim Bile and Conspiracy-Laden Forecasts"
At 11:20 a.m. on Feb. 5, Lars Hedegaard answered his door bell to an apparent mailman. Instead of receiving a package, however, the 70-year-old Danish historian and journalist found himself face to face with a would-be assassin about one third his age. The assailant shot him once, narrowly missing his head. The gun locked, Hedegaard wrestled with him, and the young man fled. 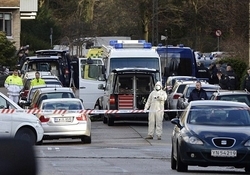 Police search the area around Lars Hedegaard's residence after the assault. Given Hedegaard's criticism of Islam and his even being taken to court on criminal charges of "hate speech," the attack reverberated in Denmark and beyond. The Associated Press reported this incident, which was featured prominently in the British press, including the Guardian, the Daily Mail, and the Spectator, as well as in Canada's National Post. The Wall Street Journal published an article by him about his experience. When the New York Times belatedly bestirred itself on Feb. 28 to inform its readership about the assassination attempt, it did not so much report the event itself but an alleged Muslim support for Hedegaard to express himself. As implied by the title of Andrew Higgins' article, "Danish Opponent of Islam Is Attacked, and Muslims Defend His Right to Speak," he mainly celebrates Danish Islam: "Muslim groups in the country, which were often criticized during the cartoon furor for not speaking out against violence and even deliberately fanning the flames, raised their voices to condemn the attack on Mr. Hedegaard and support his right to express his views, no matter how odious [emphasis added]." This theme pervades the piece; for example, Karen Haekkerup, the minister of social affairs and integration, is quoted pleased that "the Muslim community is now active in the debate." Andrew Higgins, author of a "New York Times" article about Lars Hedegaard. Secondarily Higgins delegitimizes Hedegaard, my topic here. In addition to the snarky "no matter how odious" reference, Higgins dismisses Hedegaard's "opinions" as "a stew of anti-Muslim bile and conspiracy-laden forecasts of a coming civil war" and claims the Dane has "fanned wild conspiracy theories and sometimes veered into calumny." "Den 11. september som historie" [September 11 as history] in Helle Merete Brix and Torben Hansen (eds. ), Islam i Vesten: På Koranens vej? Copenhagen, Tiderne Skifter, 2002. Lars Hedegaard with Daniel Pipes, Copenhagen, March 2007. To the best of my knowledge, no one has claimed these writings contain sloppy scholarship or wrong references. As Hedegaard puts it, "I am a university-trained historian and take my craft seriously." The real criticism of Hedegaard is not about his scholarship – but that he raises difficult and even unpleasant questions. And, as someone who has written two books on conspiracy theories, I judge Hedegaard's writings innocent of that intellectual sin. 2. Higgins ascribes to him "forecasts of a coming war"; but these are not his forecasts, only his reporting what Islamist texts and spokesmen themselves predict and advocate. 3. Higgins writes that Hedegaard "for several years edited a mainstream Danish daily, Information, is a major figure in what a study last year by a British group, Hope Not Hate, identified as a global movement of 'Islamophobic' writers, bloggers and activists whose 'anti-Muslim rhetoric poisons the political discourse, sometimes with deadly effect'." "Islamophobia" is a silly neologism intended to vilify anyone who criticizes Islam or even Islamism. In conclusion, it's not "a stew of anti-Muslim bile and conspiracy-laden forecasts" but "a cocktail of sensible critiques and unsettling analyses." Higgins has written a stew of shoddy aspersions of a brave, distinguished, and accomplished writer with whom I co-authored an article "Something Rotten in Denmark?" in 2002 and who is currently a colleague at the Middle East Forum. Shame on Higgins for this article and shame on the New York Times for publishing him. Mr. 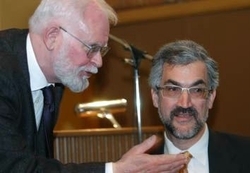 Pipes (DanielPipes.org) is president of the Middle East Forum. © 2013 All rights reserved by Daniel Pipes.